Parenting is no easy feat. It comes with its ups and downs and with many trials and tribulations. As new parents, there are many issues that moms and dads face. One of the biggest issues for parents is sleep. Being able to get baby to sleep through the night is just as important as mom and dad getting sufficient sleep at night. There have been endless debates on which method is better; however, it really comes down to preference for mom and dad. Some parents are comfortable allowing their babies to "cry it out" while others feel it is cruel and destroys the important bond that mom and baby work so hard to build since birth. While there are many methods of sleep training, the two most common are the parent soothing sleep method and the baby's self-soothing sleep method. In the parent soothing method, parents help baby fall asleep by nursing, rocking, singing, going for a drive or going for a walk. The self soothing method is geared towards babies soothing themselves and allowing them to "cry it out". If you're not comfortable letting baby cry it out but you want baby to be able to soothe him or herself, combine both methods and reap the benefits of both. 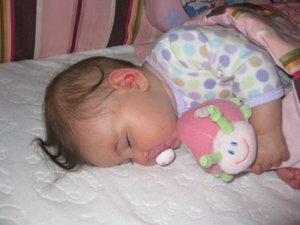 For techniques and a full explanation, read the Top 3 Baby Sleep Training Methods full article on my freelance writing profile. t", they will eventually fall asleep on their own. While this helps baby fall asleep easier, if he happens to wake up in the middle of the nireap ght, it will not be easy on mom and dad. They will have to endure minutes and, at times, hours of crying until baby learns how to soothe himself. With the self-soothing method, the baby is put down tired but awake. Parents allow the baby to "cry it out" until he falls asleep. They can come into the room intermittently to check on the baby but do not pick up the baby or comfort him in any way. The advantage to this method is that baby will soothe himself to sleep therefore, when he wakes up throughout the night, he will put himself back to sleep on his own again. This method is thought to build confidence in babies; however, it is very difficult for parents, especially first time parents, to endure. If parents are not comfortable with either one of the above mentioned sleep training methods, they can try combining them. Baby can be put to sleep sleepy but awake. For the first week, mom or dad can lie in bed with baby or next to him until he drifts off to sleep. The following week, mom or dad can sit next to the crib or bed and hold baby's hand until he falls asleep. A few days or a week later, mom and dad can sit in the room until baby falls asleep but not have any physical contact with baby while he drifts to sleep. A few days later, mom and dad can stand at the door until baby falls asleep. Eventually, baby should be able to fall asleep on his own without any help from mom and dad and, hopefully, without a lot of crying and fussing. Regardless of the method parents choose to sleep train their baby, it has to be one they are comfortable with. It also has to be one that is safe for the baby. If parents allow babies to cry, they should ensure that they are able to recognize a baby's distinct cries since, at times, he may not be crying to fall asleep but instead for other reasons. The most important aspect of sleep training is patience. No matter what method parents choose, it is sure to take several days if not weeks of practice to master.